RRB Group D Exam Analysis 2018: Railway Recruitment Board The RRB Group D exam is started from 17th September 2018 & will continue till 14th December 2018. 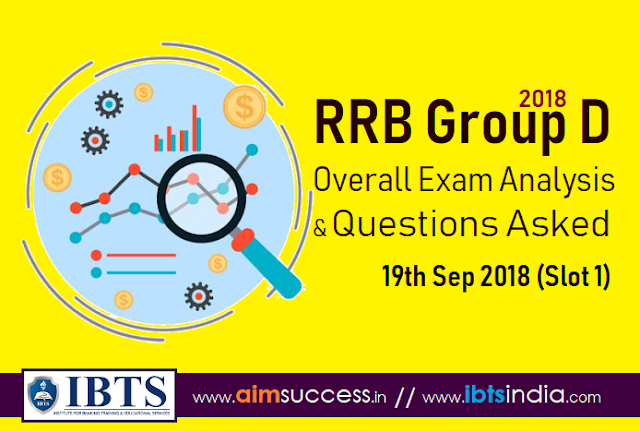 The First Shift of RRB Group D Exam is over now & In this article we aimsuccess & ibtsindia are providing you with complete & detailed RRB Group D Exam Analysis 20th Sep 2018 & Questions Asked (Slot 1). This will help you to evaluate your performance and estimate your score. Age difference between Father and Son is 30 Years. After 7 year, father's age become 2.5 of S On's age. What is the present age of Father and Son? A and B are brother, D is E's son. C is mother of B. E is father of A. Then relation between C and E?